Posted by Bravado Cooking for Men in Classic American Dishes, Classic Grilling Recipes, Recipes. I wanted to continue with our series on French Classics, but I have run out of things that I know how to make. I usually like to make a dish at least twice so that I can proceed to talk like the renowned expert that I am, but I’m going through a period of laziness and can’t get up for Vol Au Vent. This languor made me think of Andy’s Six Pack Chicken, a wonderful slow method of making that great American Classic – BBQ Chicken. Summertime, sunshine and weekends seem to make guys think of firing up the grill and drinking some beer. This recipe is the perfect answer to that urge and creates some special fun – women get a chance to complain about the beer drinking and the men get to smile at each other and continue dong what they “damn well please”, while having good reason to do so. Let me explain. Andy’s (who is ason-in-law, btw) methodology, handed down and proven over a number of generations, is interesting – the chicken is done when you finish your six-pack, and only then. This tends to be about a three-hour process but is strangely dependent on the beer consumption. Obviously, you need a six-pack available for each of the custodians of the grill. When the women fuss about the beer drinking, you simply respond that you are following the traditional recipe – and we can’t break tradition. After they taste the final result, eyes will soften and that earlier ire will melt into a warm-hearted glow. As they look up, you’ll know that they have gotten the message that their men are really cool guys. I suggest that you keep this recipe to yourself – it is so simple that it is almost silly. 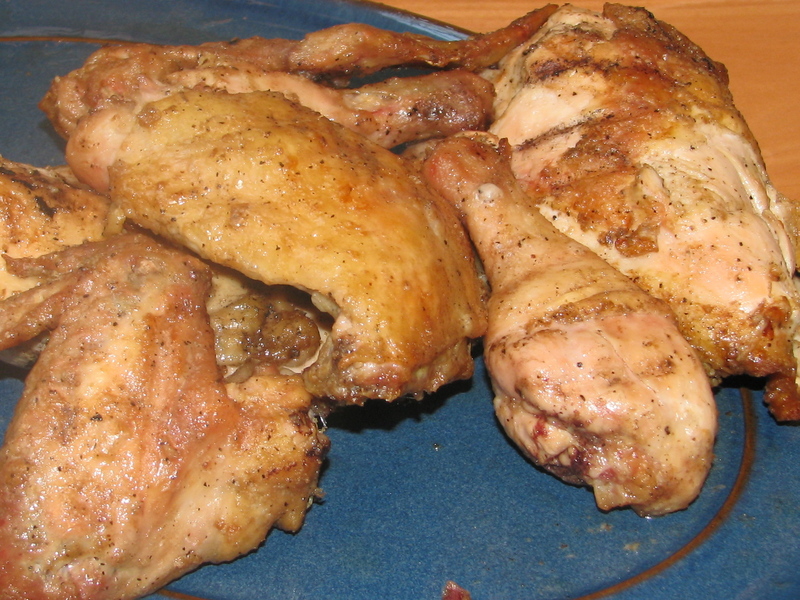 Tell everyone that it is very complicated – good grief, you have to marinate the chicken overnight. It’s an old family tradition, and someday you’ll give them a copy, but you really don’t have time to write the whole thing down now. Indirect Grilling: The best way to do indirect grilling is with a large charcoal grill where you can put the briquettes on one side and the meat on the other side. This produces a relatively low heat – usually about 250-300 degrees, which is perfect. The grill shown below is the famous Weber Big Ranch – the gold standard for indirect grilling. You can also do indirect grilling on a gas grill that has at least three burners. In this case, you light only one burner and put the meat over the unlit burners. The night before the barbeque, whisk together the oil, vinegar, egg, salt and pepper. Put the chicken pieces into a 1-gallon zip-lock bag and pour the marinade into the bag. Put the bag in the refrigerator. Turn the bag over before you go to bed and once more in the morning. Prepare the grill for indirect cooking and put the chicken pieces on the grill away from the fire (see discussion above). Pour the marinade out of the plastic bag into a small bowl. 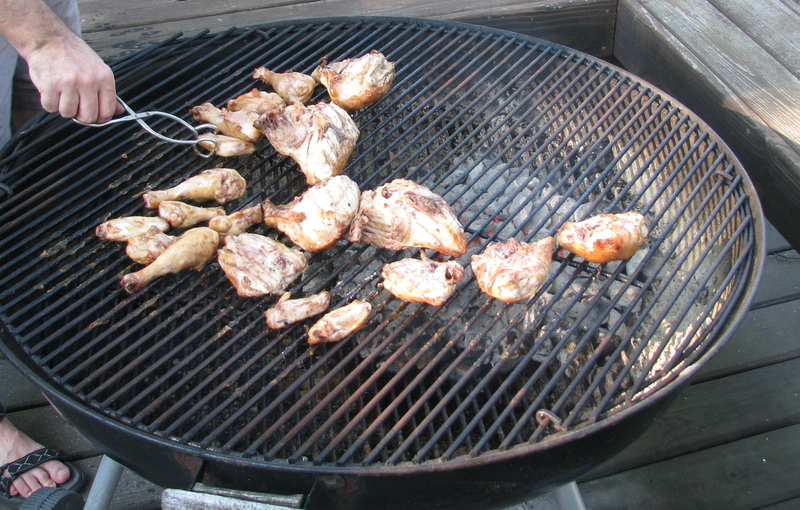 Using a brush, baste the chicken every 15 minutes with the marinade, and turn the pieces every 30 minutes. When you finish the six-pack, take the chicken off the grill, cover with foil and let sit for 10 minutes. I can’t wait to try this Saturday…. I was looking for a reason to have an extra 6 pack of beer. And the chicken sounds delicious as well.